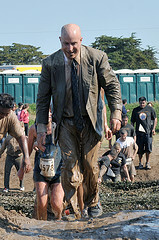 4) Oh and did I mention you will get really muddy? Expect almost anything in terms of obstacles during a mud run. Imagine a military style obstacle course, but you are slipping and sliding in mud. Below you’ll find a few things to consider wearing if you are going to do a mud run. Old clothes are absolutely necessary. Obstacles may burn, rip or tear your clothing so go into this with the idea that you will not be keeping the clothes when you are finished. Ladies, a sports bra is best and recommended because of the sheer amount of running, climbing and jumping. -What Not to Wear to a Mud Run. If you wear glasses you may want to replace them with contacts during the mud run. Besides getting muddy, your glasses may break or become lost throughout the course of your mud run. Long hair is going to be a burden. Tie long hair into a ponytail or braid it. You will get mud in your hair; deal with it. Shorts are best because long pants will slow you down and be very heavy. Avoid denim as well, as they will get very heavy with mud. Some sort of shoe is a good idea, but cotton socks are not a good idea. AVOID cotton socks because of blisters – socks that cover higher than the ankle are the best. Shoes you can tie on are best but water shoes are a really good idea also. Cheap and comfortable, water shoes will be easy to clean and if they are too dirty you can donate them at the end of the event. Regardless of what you wear, remember the point of a mud run: to get muddy, challenge yourself and have a good time. Another good tip is to avoid wearing cotton to a mud run. Cotton tends to rub when it gets wet, and when cotton rubs against your skin, it causes chaffing.